One of the great things about having a food blog is you often receive a lot of recommendations for restaurants to sample. There are some ethnicities that I do not have represented on Chicago Alphabet Soup and some that I do not have represented as thoroughly as possible. There is one community in Chicago that has a large presence and surprisingly, I had only two restaurants reflective of said community — Italian. A flurry of email notes had come to me lately and one that stood out more was with a suggestion that I try a certain Italian restaurant in Chicago’s Near West Loop. Having ventured into the West Loop neighbourhood on occasion to meet with friends at any of the few coffee shops, I was familiar with a lot of growth in the area and I also had the chance to dine at a few of the establishments there. But after following a cue from one individual who had recommended the Italian restaurant I mentioned, I have a feeling when I return from my assignment in Washington, DC, I shall venture to the West Loop more. 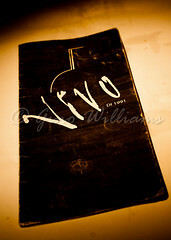 Vivo, at 838 W. Randolph Street, opened its doors twenty years ago and this fall marked its anniversary. Very large, mood lighting set, and filled with patrons whose palates appreciate fine dining, Vivo is a top restaurant that I am surprised I had never heard of prior to the prompting sent to me in an email note. While there are plenty of seats in the main dining area for small and large parties of diners, outdoor seating, and a very appealing full bar, there is also a relaxing lounge upstairs. But this adventure was about food, more than about leisure. 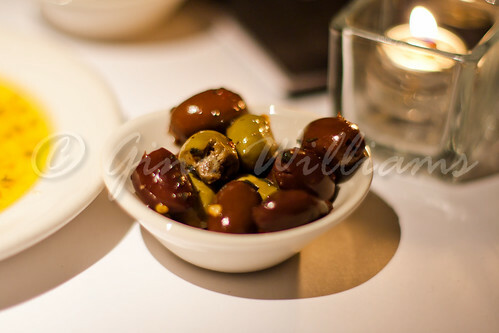 A colleague and I met at the restaurant to treat our taste senses to the culinary delight of the Vivo kitchen, and so that I could now say that I have at least three Italian restaurants I can recommend without hesitation. 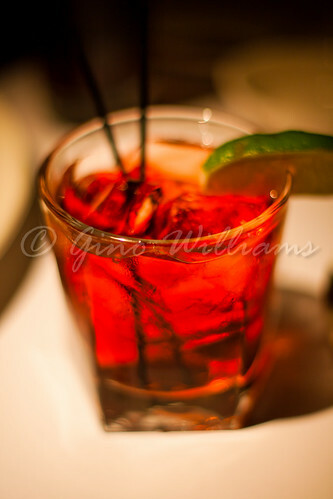 My friend and I had decided that we would not order from the menu, instead opting to accept advice from the server and have what came to the table. While we waited for the experience to begin, we partook of a whole loaf of bread with a saucer of grated parmesan and pepper in olive oil. The flavour of the bread and oil combination was a clear indication that the rest of the evening was going to be a winner. Because I had intentions of writing a journal of the evening, we had each dish come to the table individually. 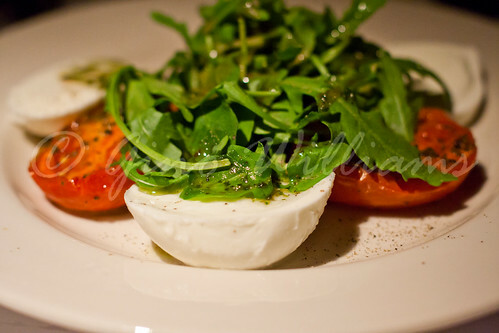 We started with a caprese, which is a simple antipasto that is very common in the Italian region of Campania. Four grilled tomatoes and mozzarella cheese seasoned with salt, ground pepper, basil leaves, and olive oil were served and our palates screamed with appreciation for the flavour that burst forth with each bit. 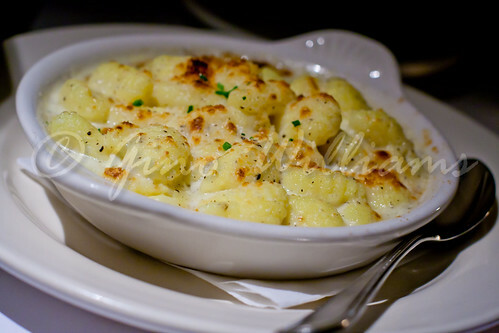 Next we had Gnocchi Gratinati. These handmade Italian potato dumplings with parmesan cream and black truffle essence usually come as an entrée. However, we were treated to the inviting dish as an appetizer. Having had Gnocci in the past that ranged dramatically between rubbery to mushy, it was a delight having it prepared in a manner such that it melted on the tongue. The cream gravy was perfect, that being it did not dominate the dish, and it was not so minimum that the dumplings were too much. There was a perfect marriage of ingredients, spices, and flavour. We had decided that we would have two entrées. Vivo entertains a rustic influence in the preparation of its food, so we opted for something with less of the traditional pasta and red sauce. 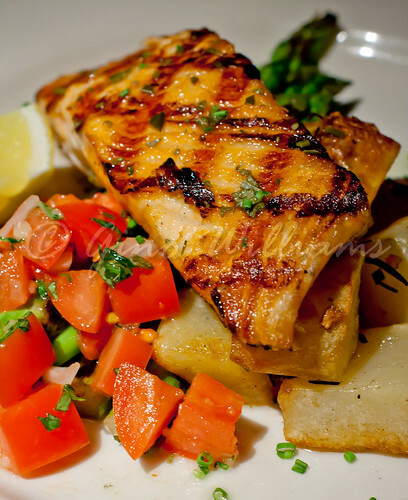 The first entrée was a plate of salmon, potatoes, and salad. The starters were already top and having the salmon dish made us aware fully of just how splendid Vivo is with its dishes. The salmon was lightly seared, but not to the point where the salmon was dry. No, the salmon was tender, flaky, and full of flavour. Coupled with the rustic potatoes and salad that also tasted like the ingredients had been picked from a nearby garden, we received each bite with anticipation of what our next entrée would be like. And when the next entrée arrived at the table, we were treated with something that really sets Vivo apart from any other Italian restaurant I have dined at in Chicago. 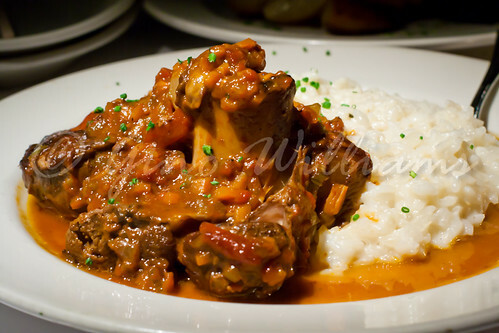 We had succulent lamb in a rich brown gravy served with risotto. Of course, by now, we were moving in slow motion, but we were very much happy with the dish. The lamb must have been cooked very slow for several hours because it pulled back from the bone without any assistance from us and there was very little chewing to be done, as the lamb could have been likened to the effect that you get when you eat cotton candy. As to the risotto, I will not try to cook it at home ever again. I shall go to Vivo any time I want risotto that leaves me with a smile and a longing for more. 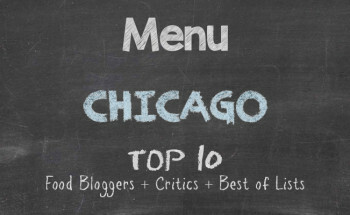 This risotto must be flagged in some critic’s write-up as the best in any Chicago restaurant. That is not exaggeration. We sat for a while so that we could digest a bit of the food we had been eating — for what was about two hours with ten-minute breaks in between. After some time had passed, we decided that we would have a dolce or two. However, we opted for something light. First to the table was a plate of lemon sorbet, raspberry sorbet, and a mixture of fruit. Usually I would have gelato, but the sorbet was a very nice touch and an addictive choice. The lemon sorbet tasted as fresh as a freshly squeezed lemon. The raspberry sorbet had to have been prepared with fresh raspberries, much like the ones served along with sweet strawberries, and plump grapes. Next to the table was a slice of heaven. 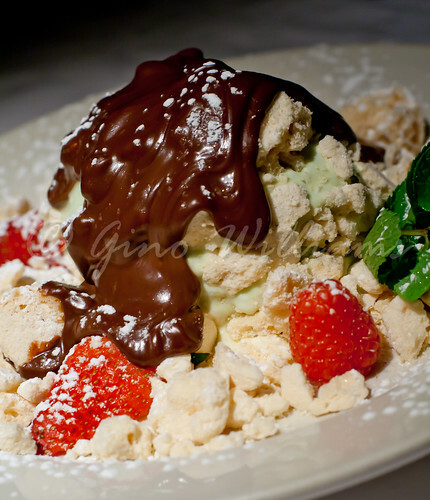 Pistachio ice cream under meringue and served with raspberries and strawberries under hot fudge was just the dessert that could salvage any broken relationship. These desserts were so delicious that it was wrong for them to be so blooming outstanding. This was the perfect end to a fabulous meal, although we left walking in slow motion because of so much food, so much delicious and inviting food. 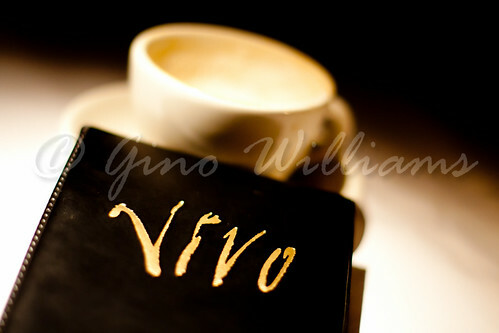 Vivo is not a run-of-the-mill eatery and while most restaurants that have great ambience do not have the balance of great food from the kitchen, Vivo does a fantastic job in both atmosphere and dining. It is apparent that on weekends, there is an influx of patrons and the restaurant is in constant motion. However, the service was fabulous and top in a way that should be bottled and marketed to several eateries in Chicago and outside of Chicago. If you happen to be in Chicago’s Near West Loop neighbourhood, there are several options from which you can choose for your dining pleasure. If you want a dining experience that is a guarantee not to disappoint, make Vivo at 838 W. Randolph Street your destination. It took me a long time to get there, but it will not take me a long time to return. This is where I work. Come see me on Sundays! Wow. Many thanks. I just relocated to Washington, DC, and will be here through the remainder of the year. When I get back to Chicago, I will make it a point to drop in and I will be sure to go on a Sunday. I thought at first that I was going to get treated to franchise style Italian food. No, this was the most authentic rustic Italian food I have had in the States. I will return, for sure.